During the holidays I go ALL OUT with decorations around the house. My ultimate goal is to add to my decor during the after Christmas sales year by year until my house looks like a replica of The North Pole! Every year we do in home holiday pictures. This time I decided to include the fur babies. 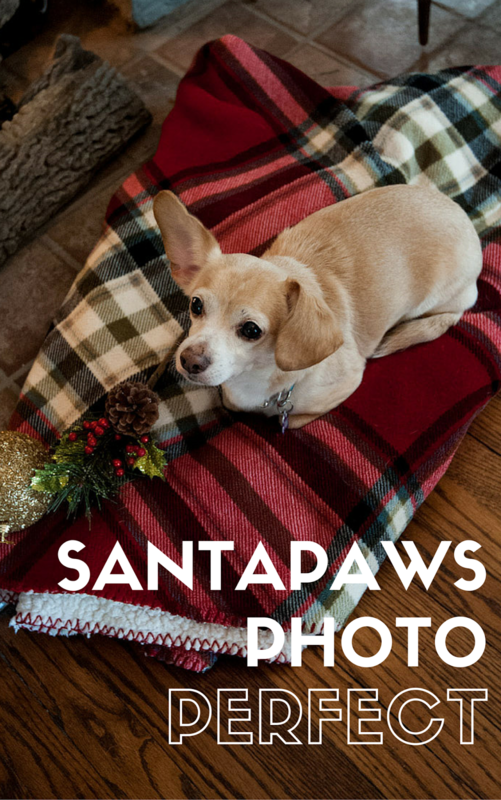 Let’s just say I learned some key pointers for my fellow readers who decide to host their own Santapaws photo shoot. 1. If you have a small dog, choose a warm snuggly spot. My little Emma loves to just lay around. 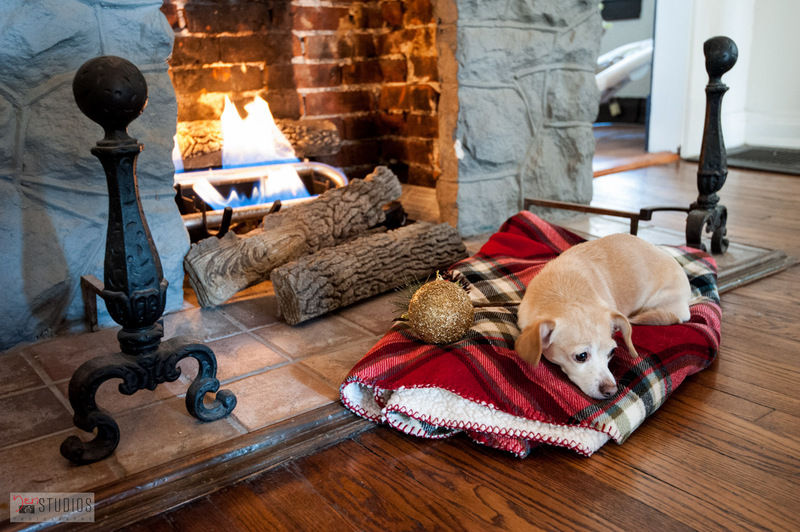 In order to get her to cooperate, I snagged a plaid fluffy blanket (Target) and placed it by the warm fire. She was happy to oblige. 2. 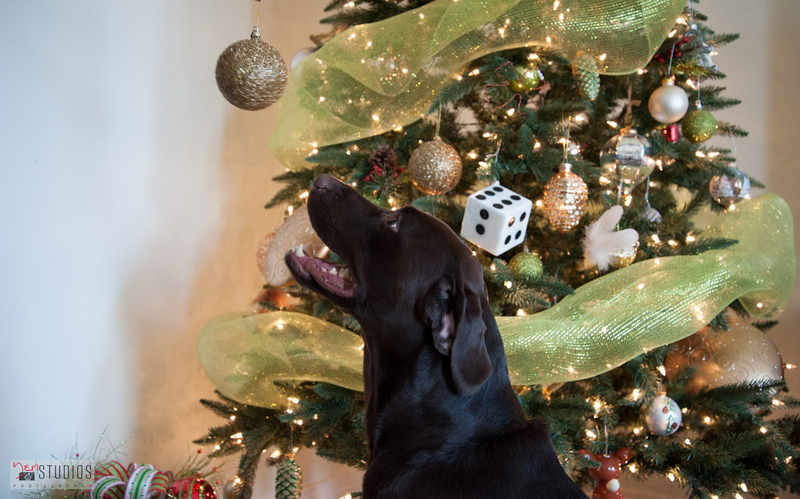 For a pup that won’t cooperate, choose an ornament that looks like a ball, tell them to sit, and hold it above their head. Harley, our 3 year old lab, is one pup who is FULL of energy. After spending an hour trying to get him to sit and stay, I decided to think like him. He LOVES balls and will generally sit and wait for me to throw one, hence the retriever in him. Perfect! 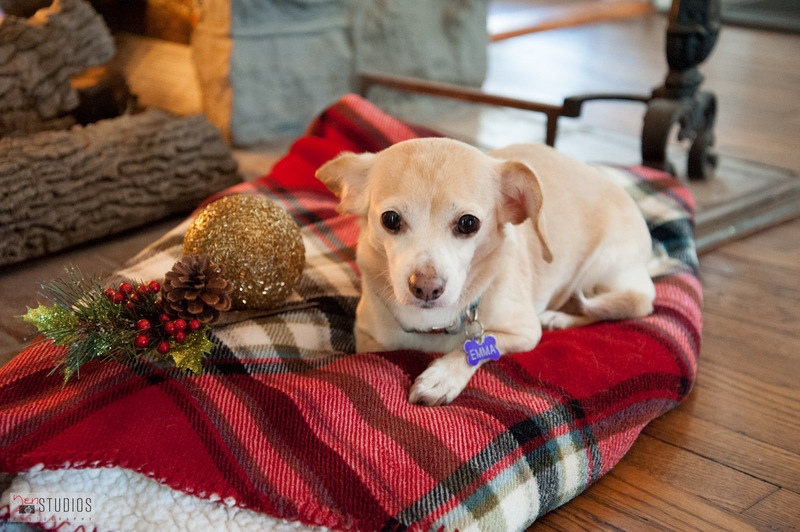 An ornament that is round and pretty held above him will have him sitting pretty for the camera. 3. Use props for a splash of holiday cheer. During Christmas you will be able to find plastic mistletoe, glittery pine cones, or ornate ornaments, if not in your home, at any local shop. Create a little holiday collage for a splash of holiday cheer. 4. Do not get frustrated. Patience goes a long way. In my attempt to find things that looked like a ball but were still decorative for a holiday photo, I chose the round white fluff ball of a Santa hat, WRONG DECISION. Harley did not sit and wait patiently, he saw “fluffy” and decided it was a game of “get the stuffed animal”. The frustration festered but I reminded myself that it is Christmas time, not room for negativity, plus, he is having a great time…even if it is at the expense of mine. Stay patient and try new tactics as all animals are motivated differently. 5. Reward them for a good shoot. Once your furry friend gets the hang of it, be sure to give rewarding rubs so that they know they are pleasing you. I would not recommend busting out treats at this time. Food tends to pull the pup completely out of the element and more focused on the food at hand instead of the task.